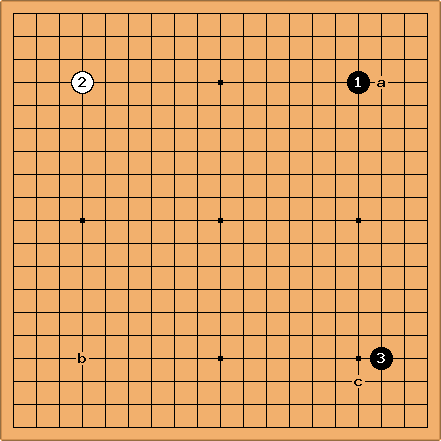 Waltheri is a kifu database with a great positional search interface. You can find it at http://ps.waltheri.net/ for the positional search or http://ps.waltheri.net/database for all the games of a certain player. Let's look at the widest path; that is, the most common move in the database at each stage. I've listed every alternative move with at least half of the frequency of the top move as a popular alternative. I made this widest path search on 2017-09-18. In total, Waltheri had 74,659 kifu. (41,192 games - 56.9%): The hoshi. Popular alternative at a, the komoku (29,252 games - 40.4%). (20,883 games - 50.7%): The adjacent hoshi. Popular alternative at b, the opposite hoshi (12,083 games - 29.3%). (8,835 games - 42.3%): Black plays a parallel opening with this komoku. Very close alternative at the other komoku c (8,584 games - 41.4%), which leads into the high Chinese and low Chinese fuseki. 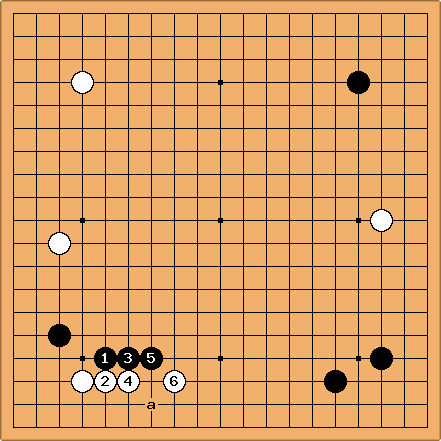 (5,277 games - 56.2%): White takes the empty corner with this komoku. Popular alternative at a (3,393 games - 36.1%), the hoshi. 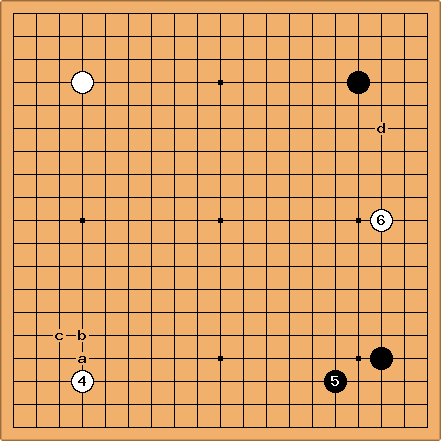 (2,200 games - 29.2%): Black makes a small low shimari, playing the orthodox fuseki. Popular alternative at b (1,662 games - 22.1%), which makes a high approach to the komoku. Another often-played alternative is at c (1,420 games - 18.9%), making a low approach. (798 games - 36.2%): The wedge. Popular alternative at d (645 games - 29.2%), the low approach to the hoshi. (277 games - 37.5%): The low approach. Popular alternative at a (168 games - 21.1%), the high approach. (130 games - 43.5%): White plays a three-space low pincer. As far as I can tell, White hasn't played this pincer since 2013. Most of the professional interest in the rest of the path seems to centre around 2006 - 2011. Popular alternative at b (86 games - 28.8%), the two-space high pincer. (66 games - 50%): A press. (65 games - 98.5%): Only Hong Kipyo deviated here, playing the thrust up. (65 games - 100%): The first 100% consensus on a move of the path. (28 games - 80%): Attacks the white stone. (16 games - 57.1%): Jumps out. Popular alternative at a (10 games - 35.7%), the counter-pincer. (16 games - 100%): Makes a two-space base. (2 games - 50%). 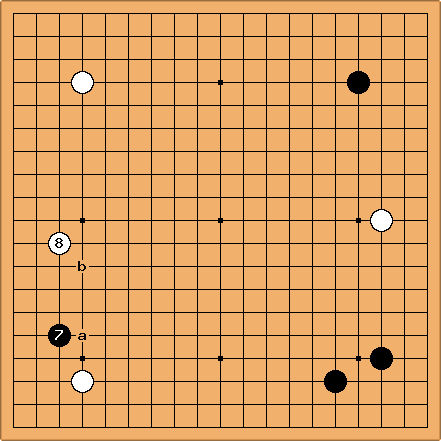 The alternative moves played here are a and b, with one game each. This is the end of the path. At this point, Zhou Junxun hane'd at a in 2008; whereas Kobayashi Koichi hane'd at b in 2009. From the data, it seems to me that the three-space pincer at was a fad for some time around 2006 - 2007, before being exhausted or refuted, causing the pros to eventually move on by around 2011.